﻿Kia Motors today announced names of two young kids who would be representing India as Official Football Match Carriers in FIFA World Cup 2018 which will be happening at Russia from June 14. For the first time the OMBC or official football match carriers have been selected from India which will be joining their counterparts from the world in the grand football event. Karnataka’s Rishi Tej aged 10 and Tamil Nadu’s Nathania John K aged 11 will be heading to global extravaganza to represent India as part of Kia’s initiative. 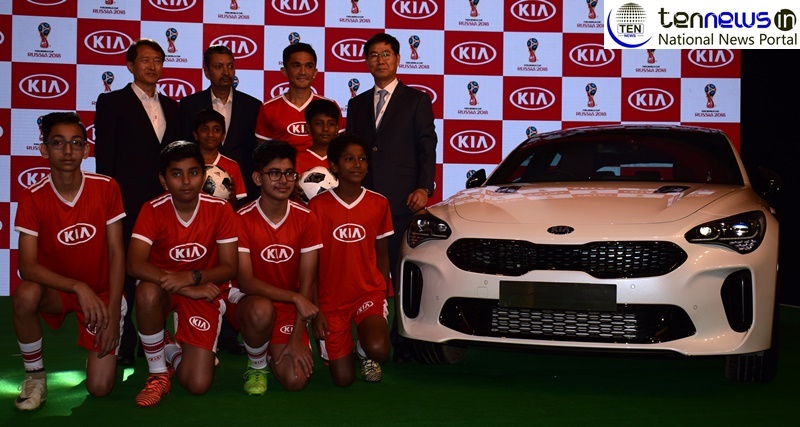 As an automative partner of FIFA, Kia Motors has provided this exciting opportunity to Indian Kids and selections for the same were done through several rounds. The two shortlisted kids will be delivering the all-important match football to the pitch where soccer legends will fight it out for the ultimate title of the football world. Indian Football Captain Sunil Chetri was part of the initiative and conducted the final trials in Gurgaon last month. Today speaking at the occasion to announce the two OMBC’s he said, “It is a proud privilege for me to be associated with this grand initiative and I am sure this will motivate these kids to a great extent to get better understanding of this globally popular sport. Through out the process it was amazing to see so many talented young kids come forward for this coveted opportunity”. Kookhyn Shim, Managing Director & CEO of Kia Motors India was also present during the announcement along with Manohar Bhat, head of marketing and sales for Kia motors. He said, “It is a great moment for Kia to provide this platform through which these two OMBC’s will be India’s official representation at this edition of FIFA World cup. We are excited to bring our global associations with leading sporting events to India and we are sure this will further motivate and inspire kids towards these sporting activities”.